As in, holy crap, we knew solar was getting cheap, but wow. 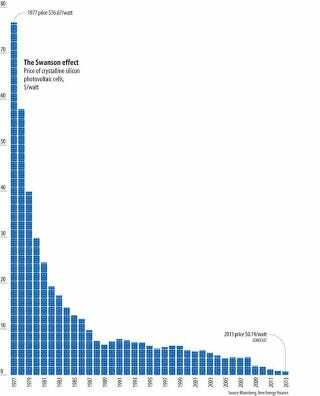 Among energy afficionados, the precipitous decline in the price of solar cells is called "The Swanson Effect." And no – not after that Swanson. Swanson’s law, named after Richard Swanson, the founder of SunPower, a big American solar-cell manufacturer, suggests that the cost of the photovoltaic cells needed to generate solar power falls by 20% with each doubling of global manufacturing capacity. The upshot is that the modules used to make solar-power plants now cost less than a dollar per watt of capacity. This means that in sunny regions such as California, photovoltaic power could already compete without subsidy with the more expensive parts of the traditional power market. The upshot? Alternative energy is unlikely to be alternative much longer.